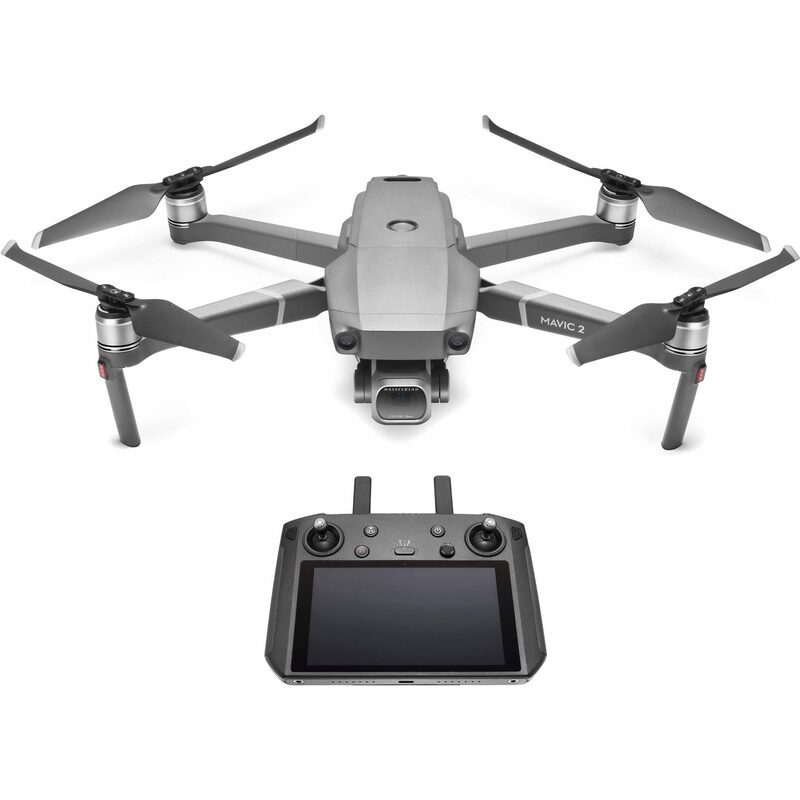 The Mavic 2 Pro from DJI is a drone that balances power, portability, and professional-quality visuals with the inclusion of a 20MP Hasselblad L1D-20c gimbal camera. The camera delivers a 1″ CMOS sensor with an adjustable f/2.8 to f/11 aperture, support for a 10-bit Dlog-M color profile, and 4K 10-bit HDR video capture. The Mavic 2 Pro utilizes a low-drag aerodynamic body design for achieving speeds up to 47.7 mph, a four-cell LiPo battery for up to 31 minutes of flight time, and low-noise propellers for filming without being distracting. This power and performance are coupled with a variety of dynamic shooting modes and other capabilities that help you achieve cinematic results. In order to help you keep the Mavic 2 Pro in control and safe, DJI has provided OcuSync 2.0 video transmission technology which can transmit a video feed to the included controller from up to 5 miles away in Full HD 1080p quality. There’s also omnidirectional obstacle sensing that provides object avoidance with sensors on all sides of the Mavic 2 Pro. All of this comes in a compact and foldable design that can be easily thrown into a backpack or large camera bag. The Hasselblad camera also supports the 10-bit Dlog-M color profile and 4K 10-bit HDR video capture. Dlog-M provides over 1 billion colors and high dynamic range photos. Your 4K HDR video can be immediately played back with correct color tones when the Mavic 2 Pro is attached to a 4K TV with HLG. The inclusion of an f/2.8 to f/11 adjustable aperture has you covered for both high- and low-light environments, delivering bright and clear photos with smooth video. With 14 EV the Mavic 2 Pro is designed to capture clear, ghost-free images by blending together a sequence of individual photos taken at varying exposures. With HyperLight mode switched on, the Mavic 2 Pro can capture low-light images with reduced noise. The OcuSync 2.0 system is designed to provide you with a high-quality and stable video feed. DJI has engineered OcuSync 2.0 to deliver 1080p feeds to your controller from up to 5 miles away. From that distance, DJI helps to keep things streaming smoothly with dual-band, real-time auto-switching between 2.4 and 5.8 GHz bands. Footage is downloaded at up to 40 Mb/s and latency can be as low as 120 ms. Forward Sensor: Dual vision sensors with a measurement range of up to 65′, and a detectable range of 65 to 131′. The Mavic 2 is designed to safely stop when obstacles are detected while flying at up to 31.3 mph. Downward Sensor: Dual vision sensors with a measurement range of up to 36′, and a detectable range of 36 to 72′. It also has an infrared sensor that can measure up to 28′ away. The sensors also allow for accurate hovering at up to 164′ and can detect land to land safely. A bottom auxiliary light helps the sensor in low-light conditions. Backward Sensor: Dual vision sensors with a measurement range of up to 52′, and a detectable range of 52 to 104.9′. The Mavic 2 is designed to safely stop when obstacles are detected while flying at up to 27 mph. Upward Sensor: Infrared sensor can precisely measure at ranges of up to 26′. High-Speed Tracking: In open environments, the Mavic 2 Pro can track subjects moving at up to 44.7 mph. © Jay Goodrich Photographer Inc. All rights reserved.